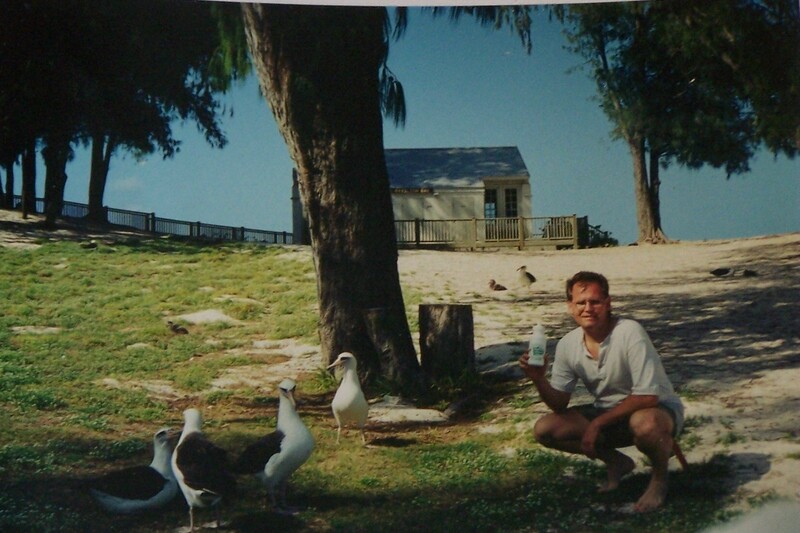 In 1998 I was looking for a new birding destination that would be different. I often like to choose places off the beaten path that not everyone would choose. That summer as I was reading through some of my old “Wildbird” magazines, I came across an article on Midway National Wildlife Refuge, and I had my destination. The article indicated that Midway/Phoenix Corporation and the Oceanic Society offered several packages for traveling to Midway. I requested the information and ultimately chose a four day package for the independent traveler. I added this to a two week trip to Hawaii to cap off my state list. The all-inclusive package for an independent traveler included round trip air fair from Honolulu to Sand Island, Midway* ($806.62). That included tax and departures fees. The room was $500.00 for four nights and included the phone and television. My meal plan included three meals per day in the cafeteria at a cost of $100.00 for four days. The food was great and the options endless. Food from all over the world was served and met dietary needs as well as vegetarian diets. My bike rental, the only mode of transportation for tourists, was $20.00 (bike #5). This brought the total cost for the Midway trip to $1,406.00 for a four day stay. Our flight was aboard a propelled Gulf Stream Airplane. My first time in a prop plane. It seated twenty five people, including the crew. Sixteen of us were tourists and four were workers returning to the island following a one month vacation they get once a year. Flight 5704 took off from Honolulu at approximately 4pm. The winds were so intense, I thought the plane would never get off the ground. Eventually it did and it took three and a half hours to fly to Midway. We arrived a little early, before dark and had to wait until it was completely dark to land. The birds settle down at night and it decreases the chance of mishap and unnecessary fatalities among birds. The view of the islands was spectacular. Turquoise waters and white sand beaches. Upon landing we were met by the welcoming committee. It consisted of staff from the Oceanic Society, US Fish and Wildlife Officers and Midway/Phoenix Corporation. We were given a brief orientation and then a bus ride to our hotel. The Hotel was the old “Bachelors Quarters” for the base. It had been renovated into a comfortable modern hotel. My room was B102. As birding was my main reason to come to Midway, I can’t leave out the fact that ALBATROSS were everywhere! Even though it was dark, the sound of thousands of birds braying like donkeys was astounding. Birds by the hundreds mulled around in areas of light from the different buildings and street lights. 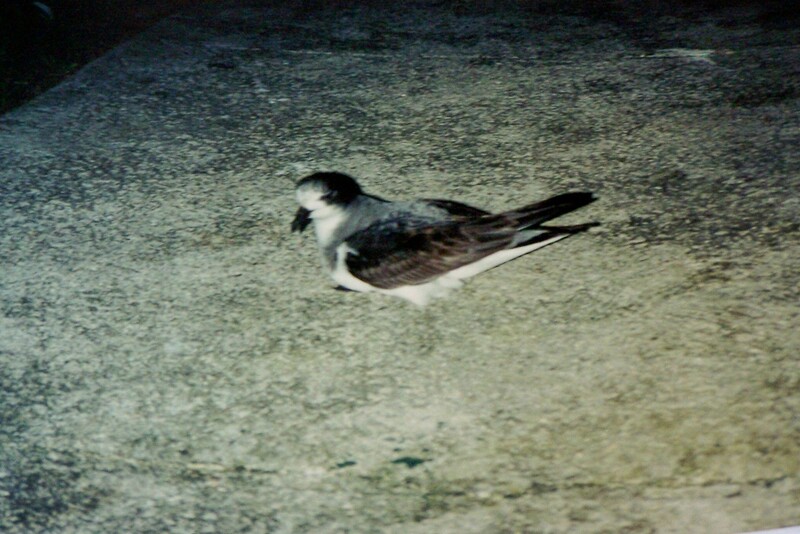 Besides the Laysan Albatross, my next lifer was BONIN PETREL. Each evening just after dark, birds come in from the sea to enter burrows dug all around the building and bushes around Midway. I had a pair in a hole right outside the door next to my room. As a birding destination, Midway does not offer a great number of new species to add to your life list. It does however offer an opportunity to add some species which may be difficult to see elsewhere, and under conditions that are tough to duplicate. Only about two dozen species are seen regularly on Midway depending on the season. There are however opportunities to see vagrants and stragglers from all over the Pacific Region. The atmosphere on Midway can only be described as what you would expect in the Galapagos Islands. Completely tame birds surround you at all times. The birds are so docile that they come right up to you and pull on your clothes and equipment to investigate the strange objects in their home. Even the wildlife are fearless. 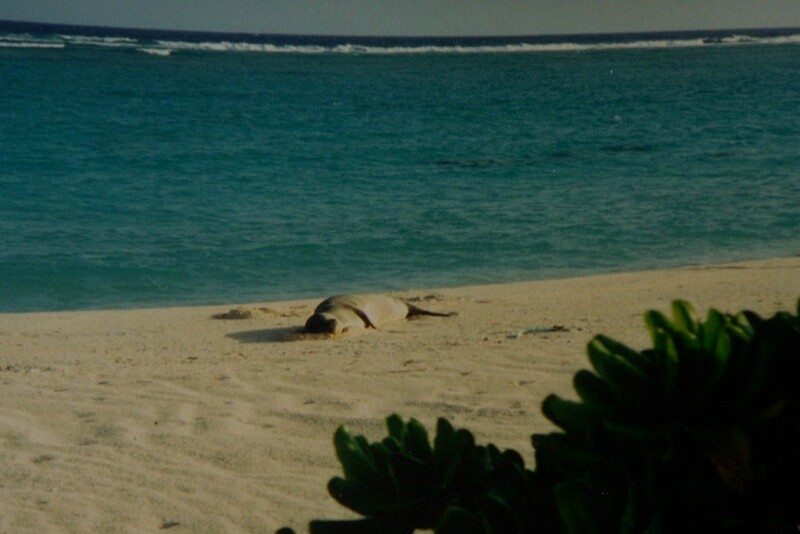 Monk Seals would laze on the beach as huge Green Sea Turtles crawled up to bask in the sun. Up close study was possible at all times. There were strict regulations on the island however. The “Rule of Thumb” was to be followed at all times. If you held your arm extended and gave a thumbs up, the wildlife you are viewing should be smaller in your view than your thumb if the animal is larger, you are to close and should back off. The only exception to this was the birds. You are not allowed to touch the birds, but that was the extent of the restrictions. The birds were allowed to touch you, and often did. As I sat photographing birds, a Laysan Albatross came up and grabbed my big toe. He was fascinated with it and chewed on it for several minutes before tiring of his antics. As mentioned above many pulled on my clothes and equipment and just followed me around. The island was the most relaxing tranquil place I have ever visited. The morning of my first full day I was up before the sun. I was anxious to get birding. I had a great breakfast at the Mess Hall consisting of pancakes, eggs, fresh fruit, juice, coffee and just about anything you could imagine. I then went to the canteen and rented my bike fo the four day stay. I was off to find the “Golden Gooney”. Riding my bike around the island was a birders dream. I had never seen so many birds anywhere. My third lifer was the BLACK-FOOTED ALBATROSS. Not as numerous as the Laysan Albatross they numbered about half a million birds. Common Canary was next. These birds had been introduced to Midway nearly a hundred years ago. They thrived there and multiplied into the thousands. It was thought that once the eradication of the Ironwood Trees took place, the Canary would decline. To the contrary, the native grasses increased providing a better food supply and the Canary’s flourish. There were also Common Mynahs on the island. 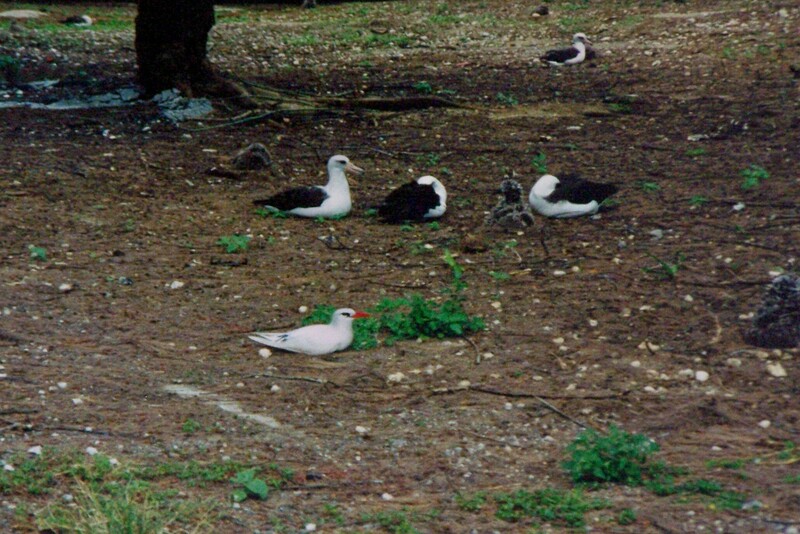 These birds are common on the main islands, but only recently showed up on Midway and seem to be becoming established. Other birds that were seen, but not lifers included: White Tern, Pacific Golden Plovers, Black Noddies, Wandering Tattlers, Red-tailed Tropicbirds and Ruddy Turnstones. The White Terns were of particular interest. They nest almost anywhere, in the most inhospitable locations. One pair had an egg on the bike rack where we picked up our bikes. How the egg stayed balanced between two sections of pipe was inexplicable. Another similar spot already had a tiny hatchling hanging on for dear life. 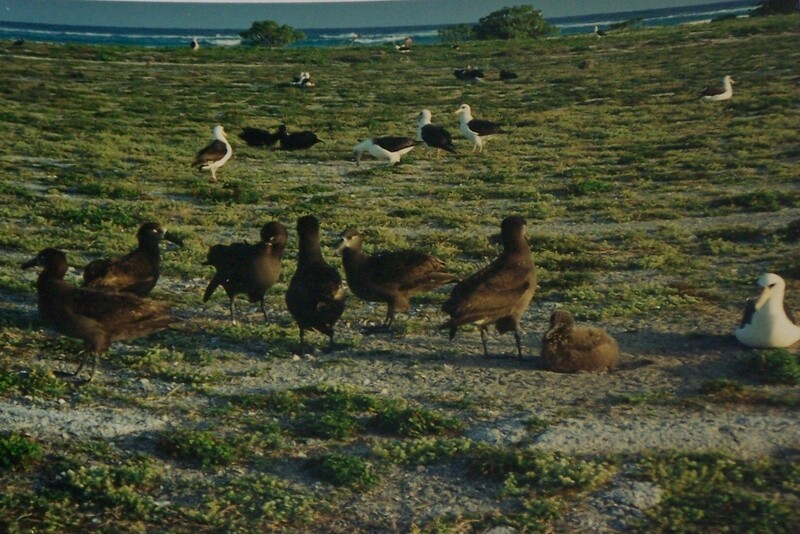 These sites could be seen all around the island, with eggs and chicks of various ages. The day ended with another great meal at the mess hall. After riding my bike around the island all day, even the noisy Albatross’ couldn’t keep me awake (earplugs helped). Having explored the island the first day and gotten my bearings, I now got down to serious birding. My main target for the trip was the “Golden Gooney” or more properly the Short-tailed Albatross*. One bird had been on the island for several months and was seen the evening we arrived. The bird would come and go, feeding at sea for several days at a time, then return to the island to rest for several days. I spoke with several people who had enjoyed up close viewing of the bird just the day before. I checked all its regular spots to no avail. I would have to keep trying. While looking for the Gooney, I found many other species and got some nice video and photos of the birds. My next lifer was “BRISTLE-THIGHED CURLEW”. This bird was actually quite common on Midway and I saw a total of 56 of them during my stay. Often flocks of a couple of dozen would sit together in certain spots. These high arctic nesters winter on pacific islands, including Midway. Each evening SOOTY TERNS appeared by the thousands an hour before dark. They could be seen on Frigate Point in abundance. 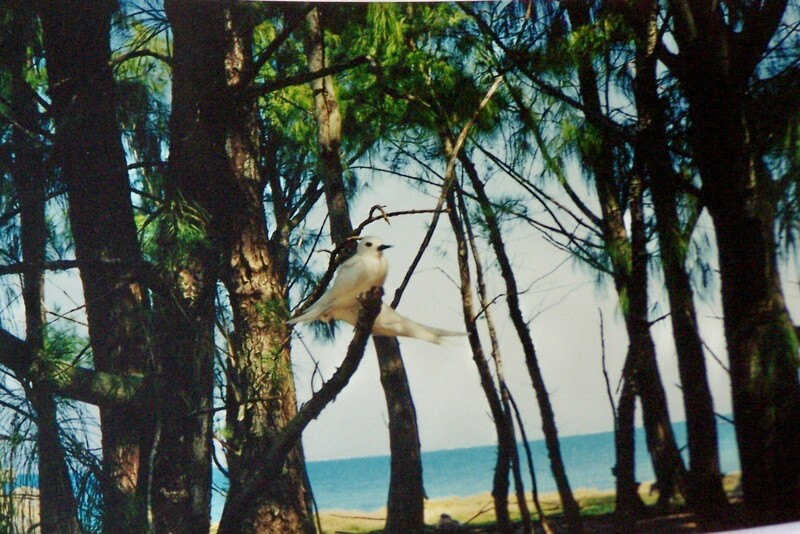 They nest on Eastern Island, just across the inlet from Sand Island. Frigate Point is named for the many “Frigates” a type of boat that passed there during the war. It was also a good spot to view Great Frigagtebirds. Today also provided close up views (rule of thumb) of at least half a dozen Hawaiian Monk Seals. The seals were increasingly frequenting the island as their “pupping time” had arrived. During my four day stay, several seals had “pupped”. The only pups I actually saw were at quite a distance, having been born “Sand Spit”, a small sandy island between Sand and Eastern Islands. Another interesting past time was picking shells. There were very interesting shells washed up on the beaches. Though not abundant, what you found were shells unlike any I had seen on Atlantic Beaches. Unfortunately, being a National Wildlife Refuge, collecting anything is prohibited. I had to settle for taking photos of the shells I found. While looking for shells and birds, I noticed a large dark object in the water just off the beach. This was at the same spot I had gone for my morning swim the same day. Though the water was clear, the object was just far enough off that I couldn’t make out what it was. I continued my walk when I suddenly realized that the object had caught up to me and was much closer. It couldn’t be a shark? It was! The sharks fin and eventually its tail broke the water as it moved into the shallows. I watched the shark as I walked along. We eventually reached a piling where boats could dock. The water became deep there as it had been dredged so boats could enter. The shark swam around the dock, then into the dark deeper water not to be seen again. When I told the woman at the Canteen she referred to it as “Tony the Tiger” a fourteen foot Tiger Shark that frequents the area. I never went for a swim again (though plenty of others did). The third day found us boarding a scow. The boat took us to Eastern Island where we would get to view colonies of breeding birds and see some sites surrounding the history of the “Battle of Midway”. En-route to the island, we had several GRAY-BACKED TERNS pass the boat out of curiosity. This life bird was quite different from any tern I had seen before. Once on the island, our leader “James” gave us a historical and Naturalists tour of the island. 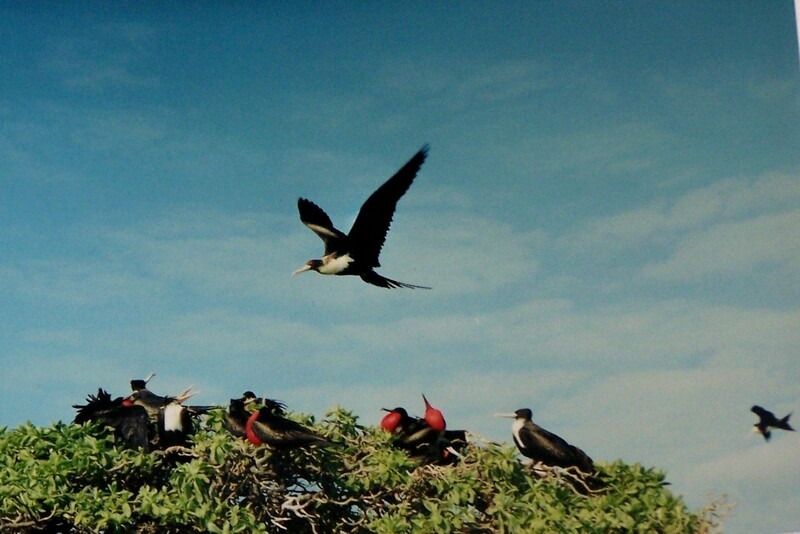 Huge colonies of Great Frigatebirds contained many RED-FOOTED BOOBIES as well. We were fortunate enough to see a brown morph Red-footed Booby as well. This morph accounts for less than 5% of the birds in the Pacific Ocean. As we toured the area, James told us about the first pair of “MASKED BOOBIES” to have nested a few months earlier on the island. There were hopes that an increased population would now become established there. As if on cue, the juvenile Masked Booby which occasionally returns to roost at the breeding site, flew in and landed on the spot, giving great views to all. It was a nice day on the island and interesting to see the difference in the breeding species here as opposed to Sand Island. James also filled us in on many stories from the Historic event of the Battle of Midway. You couldn’t help but appreciate all that the fighting men went through in World War Two. The morning dawned as beautiful as the last three. I took my final tours of the island, ever searching for the Golden Gooney* that never returned during my stay. Everyone was so aware of my desire to see the bird that “John”, one of the great docents on the island even went back to check for me one last time before our flight departed. Though I missed the GG, the day was very eventful. 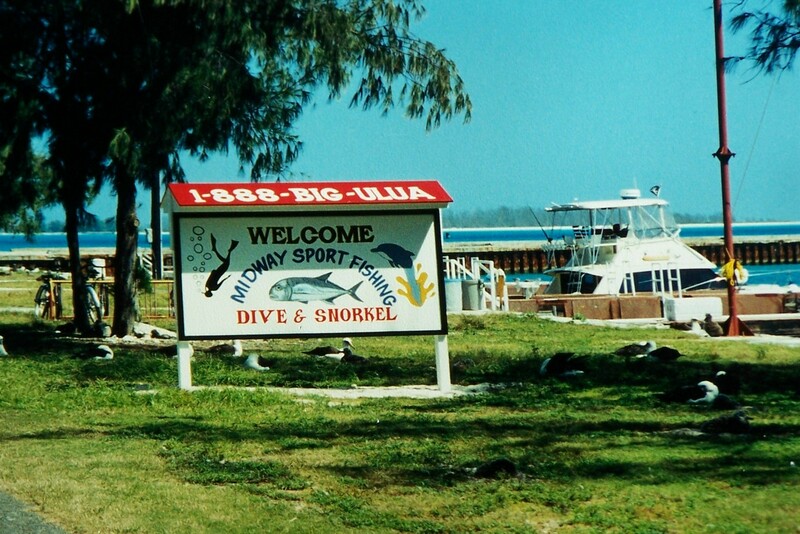 So many people had expressed an interest in a snorkeling trip that the “Midway Dive and Snorkle Crew” decided to open up a week ahead of schedule and take us out. It cost $35.00 per person and was a fabulous trip. They took us out to the main reef surrounding the atoll. We snorkeled for a couple of hours seeing Coral, Fish and invertebrates. Highlights were the many PARROTFISH, Red Sea Urchins and Surgeonfish. Once the snorkeling was done they served us a great onboard lunch of Hawaiian foods….delicious! After lunch, we were taken around the lagoon inside the reef surrounding the atoll. We saw huge pods of Hawaiian Spinner Dolphins jumping and spinning in the air around the boat. Also of note were three huge Spotted Eagle Rays which we followed for some time. It was like watching huge flying animals under water. They were each about twelve feet long and nearly as wide, awesome! Upon returning to the island, I ran into James, who informed me a Peregrine Falcon, rare on the atoll, was found sitting on the water tower. I rode right over to find him sitting there, awaiting a meal. I watched as he took off in hot pursuit of some terns. Following one last great meal at the mess hall, we packed our things and were transported to the terminal where we took off for Oahu just after dark. This was a most memorable trip, definitely the trip of a life time. 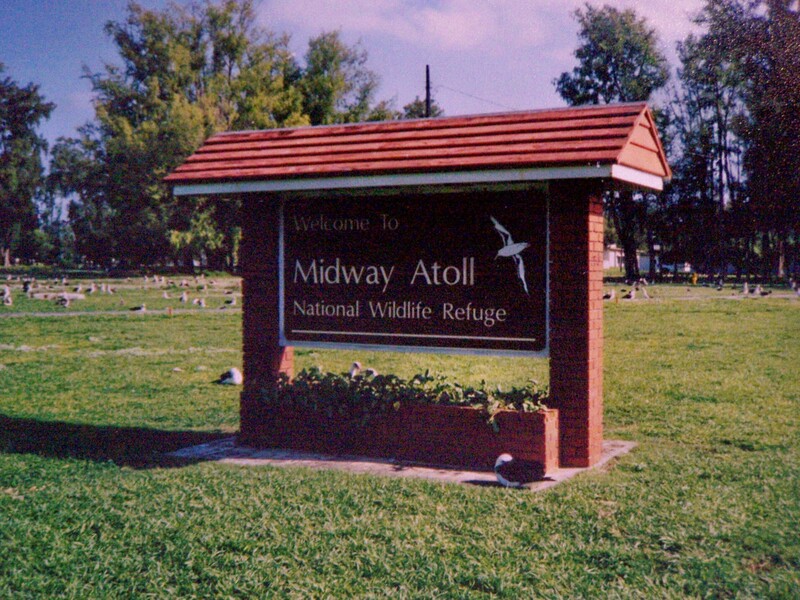 * travel to Midway Atoll was discontinued on January 31st 2002 due to a lack of interest by the public. The operating costs became to high and with a low participation they were forced to close the atoll. It remained open only as an active refuge and refueling station for trans-pacific Military and cargo flights. In 2009 the atoll was again opened to the public with weekly flights to and from the islands. The current cost is about $6000.00 per week. Just google Midway National Wildlife Refuge for additional information. * The “Golden Gooney (Short-tailed Albatross) continued to return to Midway, attempting to breed. She laid several infertile eggs through the years. Finally she returned with a mate, eventually attracting another pair as well. In 2011, after many tries, both pairs bred. One failed to hatch a chick but the other was successful. 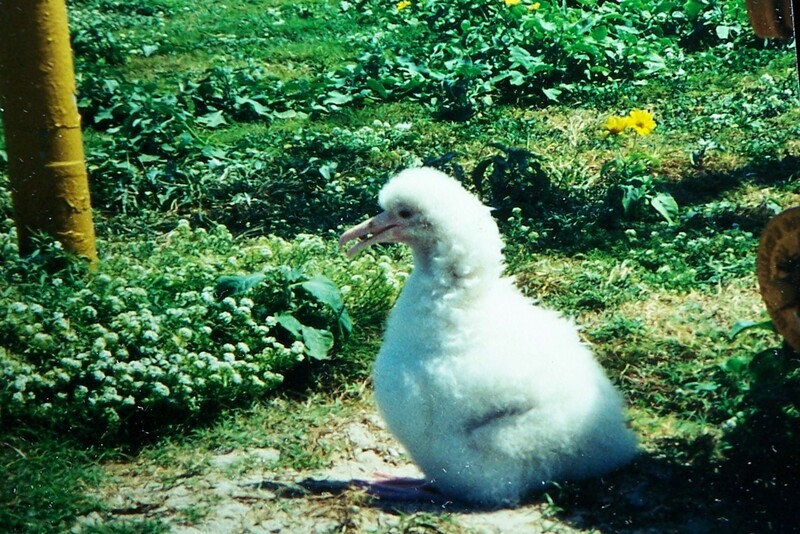 A hurricane that spring wiped out most of the chicks on the island, but somehow the Short-tailed Albatross chick survived and eventually successfully fledged. Hopefully these pairs will return again in 2012 and establish the first successful colony away from the islands of Japan. 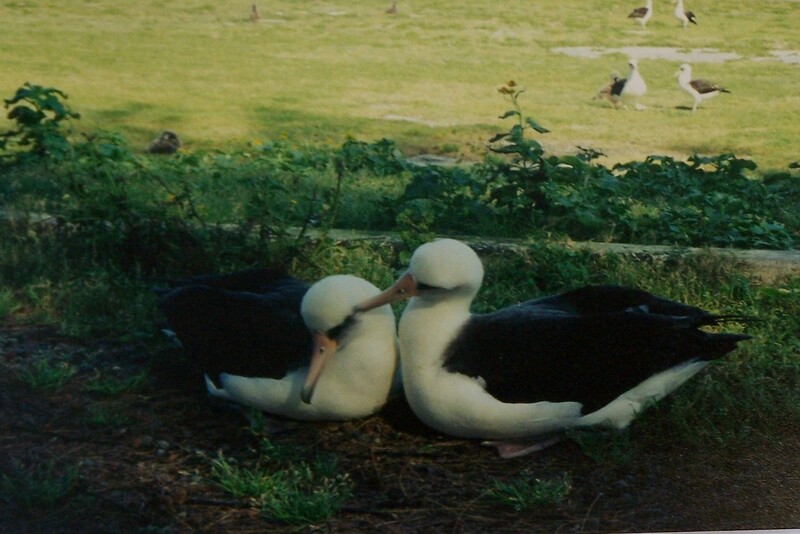 * the Albino Laysan Albatross Chick returned to Midway as an Adult in 2004 and became part of a breeding pair. this was the first of several Albino chicks ever know to return as an adult. The bird was pictured as an adult in a 2004 issue of North American Birds. Having tried to time my trip to see the highest number of species possible, I still was a little to early or late for several species. Birds I missed that are regular at Midway include: Short-tailed Albatross, Brown Noddy, Wedge-tailed Shearwater, Christmas Shearwater, White-tailed Tropicbird and Sanderling. They were expecting the Christmas Shearwaters at any minute, but they didn’t show while I was there.